How to install apt-get on Mac OS X or rather OS X Mavericks so that we can use the power of installing Debian based packages is shown in this guide. We talked about UNIX Operating System, Unix Like Operating System and Linux Operating System before. Also, we have talked about the Unix Shell. As possibly you know, there are two main types of package management systems for Linux – deb Based and rpm Based. We also talked about installing .deb package on .rpm Based Linux for Server. Yes, it is possible to extend the ways we install software with some tool which can enable using Debian tools like dpkg and apt-get to provide powerful binary package management on our latest OS X. This is why the article is named How to Install apt-get on Mac OS X. We need to install something to do that. Fink is an independent project that brings the full world of free softwares to Darwin and Mac OS X. As a result, they have two main goals. First, to modify the existing Open Source software (F/OSS) so that, it will compile properly and can run on OS X. This process is called porting. Second, to make the results available to casual users as a coherent, comfortable distribution that matches what the Linux users are used with. This process is called packaging. The project offers precompiled binary packages as well as a fully automated build-from-source system. By the way, MacPorts can port the FreeBSD ports collection. Fink can be used to install newer versions of packages installed by Mac OS X or to install packages not included in Mac OS X. Fink stores all its data in the directory “/sw” by default. This goes against the Filesystem Hierarchy Standard’s recommendation to use “/usr/local”. Within Fink’s directory, a FHS-like layout (/sw/bin, /sw/include, /sw/lib, etc.) is used. 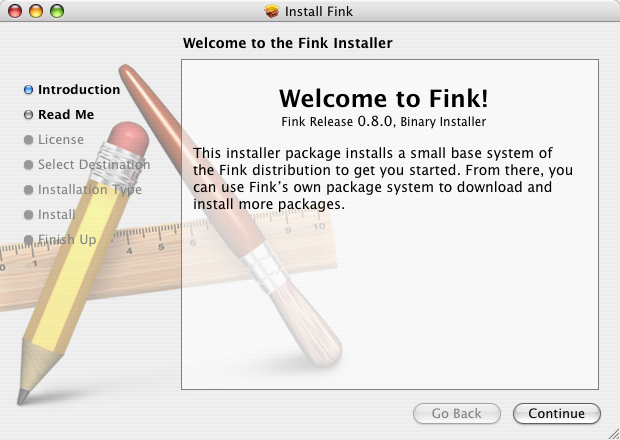 First download the appropriate installer for your system from Fink project. Run the Fink Installer.pkg file. Allow the installer to setup your bash config (~/.profile). As the last step, reload the config (source ~/.profile). Now, your Mac is ready to run apt-get command. This Article Has Been Shared 6405 Times! OS X Mavericks is slow and having high CPU usage, usually points toward some software related issue rather than hardware issue. Extra points are here for OS X Mavericks. Copy and Paste to and from a Text file in Command Line in OS X – yes, this is why we have the option in Syntax Highlighter to make it plain text or copy to clipboard! Cite this article as: Abhishek Ghosh, "How to Install apt-get on Mac OS X," in The Customize Windows, November 25, 2013, April 21, 2019, https://thecustomizewindows.com/2013/11/how-to-install-apt-get-on-mac-os-x/.